cylinder The equation for determining the volume (V) of a cylinder is V = πr2h. 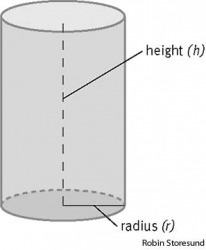 The definition of a cylinder is a three dimensional shape with two round shapes at either end and two parallel lines connecting the round ends. An example of cylinder is a can of tomato soup. "cylinder." YourDictionary, n.d. Web. 16 April 2019. <https://www.yourdictionary.com/Cylinder>. a. The surface generated by a straight line intersecting and moving along a closed plane curve, the directrix, while remaining parallel to a fixed straight line that is not on or parallel to the plane of the directrix. b. The portion of such a surface bounded by two parallel planes and the regions of the planes bounded by the surface. c. A solid bounded by two parallel planes and such a surface, especially such a surface having a circle as its directrix. A cylindrical container or object. a. The chamber in which a piston of a reciprocating engine moves. b. The chamber of a pump from which fluid is expelled by a piston. The rotating chamber of a revolver that holds the cartridges. Any of several rotating parts in a printing press, especially one that carries the paper. Archaeology A cylindrical stone or clay object with an engraved design or inscription. 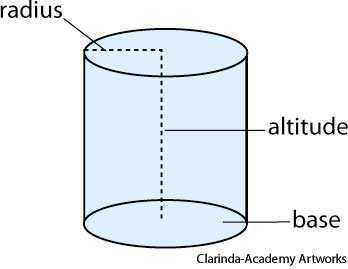 To calculate the volume of a right circular cylinder, multiply the area of the base by the altitude. A three-dimensional surface or solid object bounded by a curved surface and two parallel circles of equal size at the ends. The curved surface is formed by all the line segments joining corresponding points of the two parallel circles. When the two-dimensional curve is a circle, the cylinder is called a circular cylinder. When the axis is perpendicular to the plane of the curve, the cylinder is called a right cylinder. In non-mathematical usage, both right and circular are usually implied. The part of a revolver that contains chambers for the cartridges. (computing) The corresponding tracks on a vertical arrangement of disks in a disk drive considered as a unit of data capacity. From Middle French cylindre, from Latin cylindrus, from Ancient Greek κύλινδρος (kulindros). The aggregate of all tracks that reside in the same location on every disk surface. On multiple-platter disks, the cylinder is the sum total of every track with the same track number on every surface. On a floppy disk, a cylinder comprises the top and corresponding bottom track. When storing data, the operating system fills an entire cylinder before moving to the next one. The access arm remains stationary until all the tracks in the cylinder have been read or written. The cylinder is the aggregate of the same track number on every platter used for recording. The charge given up to the inner cylinder is known from its loss of potential. The drawing room had crystal cylinder vases strategically placed all around, filled with large parrot tulips of every shade. A cylinder of chalk was used in some of Edison's later experiments with this receiver. This drawback can be corrected to a slight extent by furnishing the hydraulic crane with more than one cylinder, and thus compounding it, but the arrangement does not give the same economical range of load "as in an electric crane. What are Examples of Geometric Shapes?